Print a report for your endo | 100% NO PAY Satisfaction guarantee! From your PC or Cell Phone connected to the Internet, store your BG, Carbs, Insulin and more. Your data is now inside the Diabase website. From there, you can edit the data, add comments and flags, and easily produce tables, graphics, XLS© sheets, and printed reports for your health care provider. Just fill-up the data, Diabase does the rest. 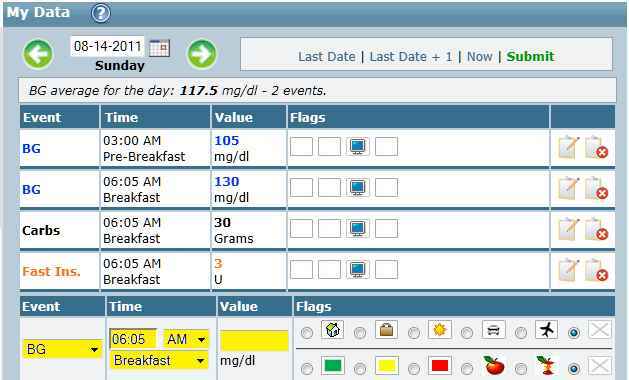 Your data can be displayed as a Calendar or a List, so to see the impact of your diet and corrections on BG. You can flag every data event, add comments, and use filtering tools to help improving control. 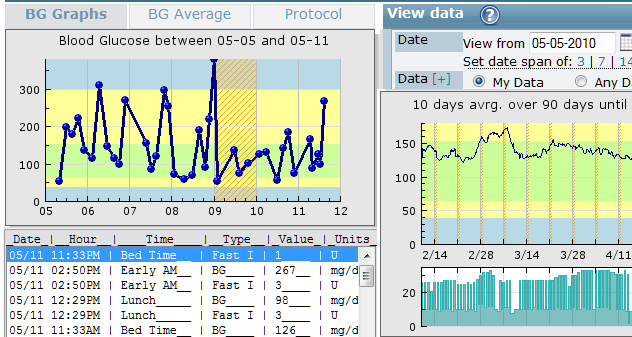 Produce stunning graphics from BG, Carbs, Insulin, or any other data you've entered. As the data is already loaded, just select the events of your liking, and Diabase will automatically display them against a period of time. 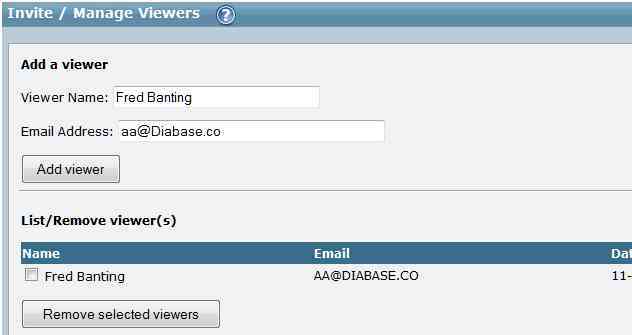 Invite your medic or family to see your data, just by sending an email (actually, Diabase sends the email!). If your medic is invited, you'll no longer need to carry 'the notebook' to visits; And during phone consultations you both will be looking at the same uptodate information. If kids go out, no need to call them. Just look at their data online! Tune-up Diabase to the colors of your liking by changing its skin. 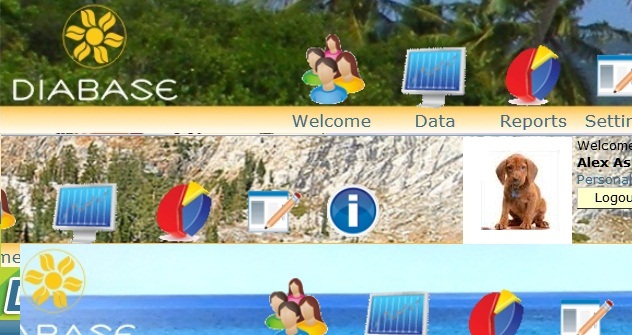 You can also upload your avatar, to greet you every time you use the site! 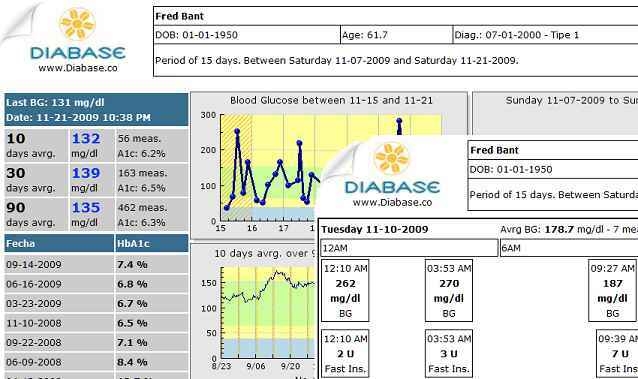 Diabase tools help you calculate BG, corrections and Insulin. 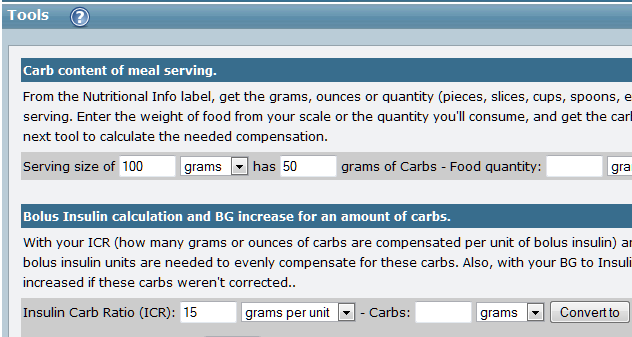 Enter the size of your serving, its carb content, and together with some other data our tools will calculate carb content of the meal, how much insulin do you need for a correction, and where your BG might go if you don't correct. Every time you enter a data event, BG records and averages are updated. 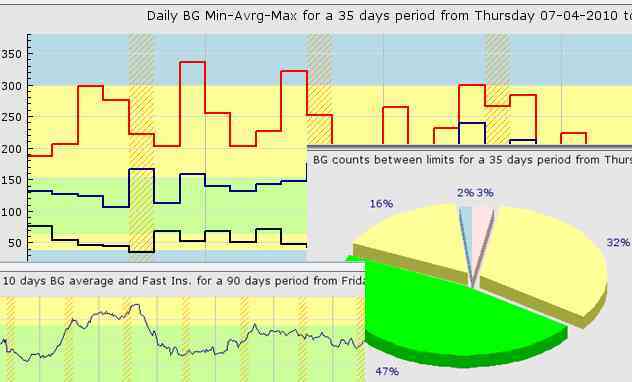 A pane on the left side will show BG for the last week and a weighted average over the last 90 days, so to see the actual trend of your controls, and not be confused by the occasional peak produced by a meal or an activity. Print a report of up to 35 days ready to show to your medic. 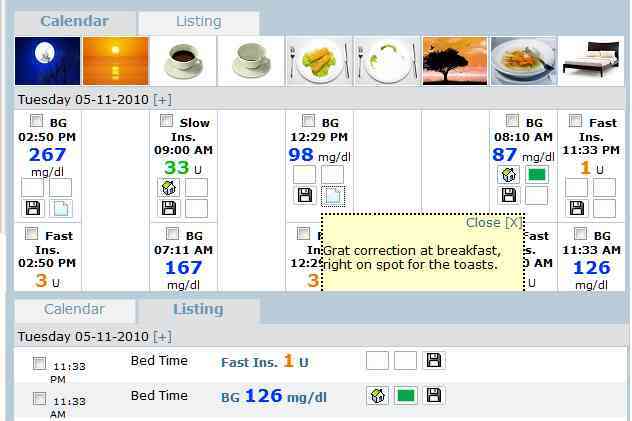 It'll show BG averages, graphs, and a day by day - hour by hour listing of BG, Insulins, corrections, carbs, or the data you select. Use Diabase for three months. If you're happy with it you pay 9.95 USD once the 3 months are due. After that, we'll remind you for payment every 3 months due. But if you're not 100% satisfied, you pay absolutely nothing, just stop using the site, and that's it. Diabase cost is about 2 test strips a month! - however, learn about our honor system. You first use it and pay only, and only if, you're satisfied with it! This is our 100% total satisfaction NO PAY Guarantee!